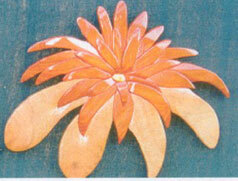 Scroll Saw Intarsia is the art of making a picture with many different colored woods. It can be quite beautiful. The feeling of accomplishment after you have finished your piece is very rewarding. Intarsia is believed to have been started around the 13th century. In the world of arts and crafts it is believed to be one of the oldest crafts know to man. I think it is one of the most beautiful crafts that was invented. Intarsia is a craft of using various shapes, sizes and different species of wood. 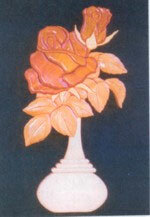 They are then fitted together to create a picture, wall murals, table tops, jewelry boxes and many different projects. Intarsia is using different colors of wood, using its natural grain to create the different colors in the pattern. I used different exotic woods from all over the world. You can get so many different colors of wood to use in intarsia. For scrollsaw Intarsia I use a lot of African Padauk for red colors and Bleeding Heart for purple. Different Cedars are great to work with because they sand so easy. You can use light maple wood for your light colors and for some yellows. Other woods you can use are birch, oak, cherry, walnut and mahogany. The choice is endless. Glue your separate pattern pieces on your wood. Figure which direction of the grain you want. I found it easiest to mark the pieces with an arrow for the direction I want the grain to go. Glue your patterns on the wood. I like rubber cement the best for this process. It adheres best and is easy to remove. Cut out the individual pieces then shape and sand them before fitting together. They go together like a jigsaw puzzle. I use an oscillating spindle sander plus my palm sander for the shaping. Scroll saw Intarsia is fairly time consuming because each piece has to be fitted and sanded to look real. After you have finished the shaping you can use additional pieces of plywood to raise areas for the design to create more depth. This effect looks especially nice on animals for their noses. Once you have the design all finished you need to cut backing. Use 1/8 to 1/4 inch plywood or masonite. I like to use masonite because it is easier to work with. Make sure your backing is a little bit smaller than your design. You don't really want it to show very much. Glue your pieces on and it is ready for your finish coat. Your scroll saw intarsia is now finished and ready to hang. All you have to do is to stand and admire your work. They also make a great gift for someone special.